"A super quick, super simple recipe any bonfire lover will enjoy! Great for kids. 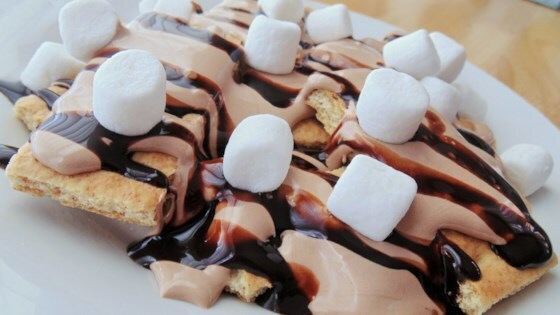 Top with chocolate syrup, caramel syrup, extra marshmallows, chocolate chunks, or whipped cream." Combine 1 tablespoon butter and chocolate chips in a microwave-safe bowl; heat in microwave until melted, 20 to 40 seconds. Mix marshmallow cream and remaining 1 tablespoon butter in a separate microwave-safe bowl; heat in microwave, stirring occasionally, until melted, 20 to 40 seconds. Stir chocolate mixture into marshmallow mixture. Arrange graham crackers in a circular pattern on a plate. Spoon marshmallow mixture onto each.